"I think she just knows that there's a lot of different friends in the world." 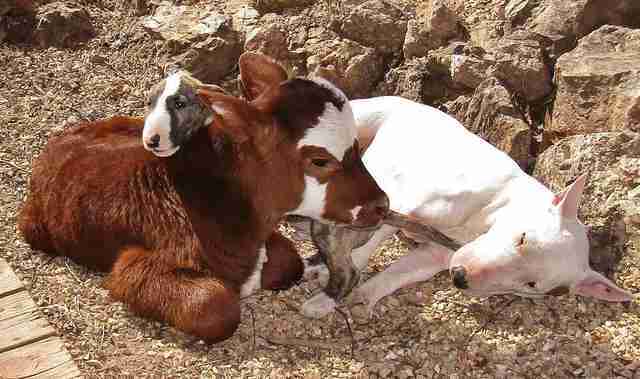 Moonpie is a baby miniature cow, but it's quite possible that she's having an identity crisis. For the past six weeks, she's lived at Rocky Ridge Refuge, a sanctuary in Arkansas that cares for special needs animals. 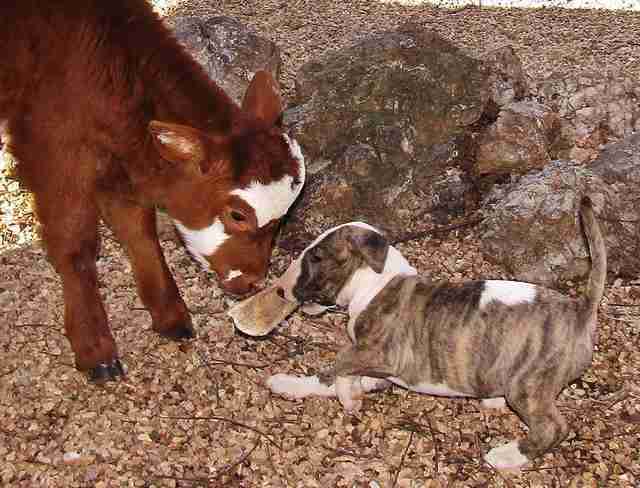 But instead of hanging with other cows, Moonpie lives with 12 dogs. 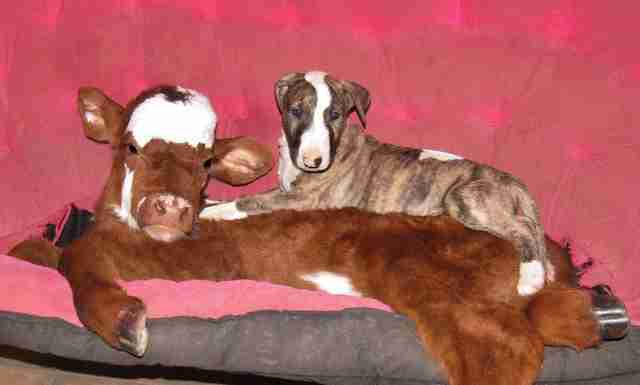 "She accepts them as her buddies," Janice Wolf, the sanctuary's founder, told The Dodo. "Babies like that - they don't know a whole lot about what it's supposed to be, so they kind of just accept things." 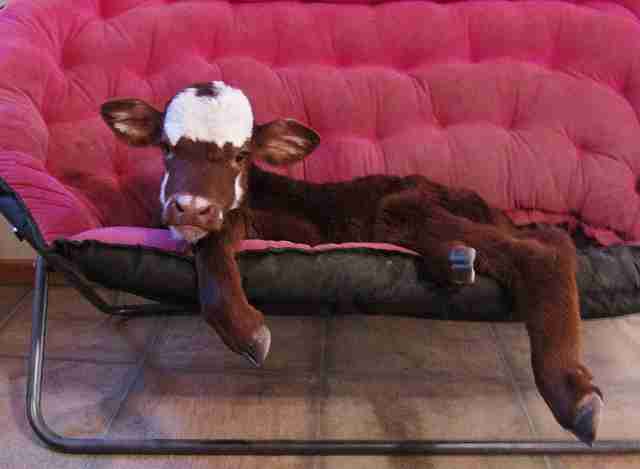 Before Moonpie lived with dogs, someone was trying to sell her at a livestock auction house. "These auctions are huge - millions and millions of animals are auctioned off everyday," Wolf said. "I stay away from them because they kind of make me crazy. 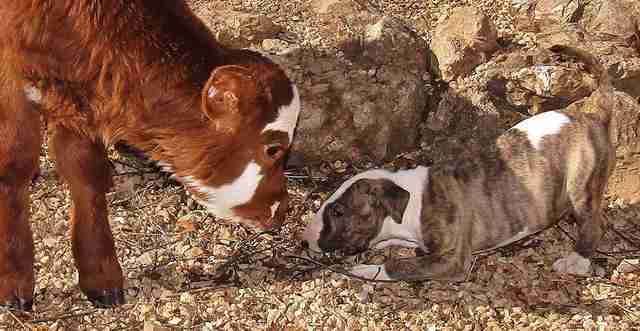 Many of the animals aren't being treated that well." Since Wolf couldn't handle going to the auction, her friend went in her place to see if she could help any animals. Her eyes quickly fell upon Moonpie. "She was a mini, and you don't see a lot of those go through the local auctions," Wolf said. Wolf's friend secured Moonpie's release by purchasing her. Then she transported her to the sanctuary. 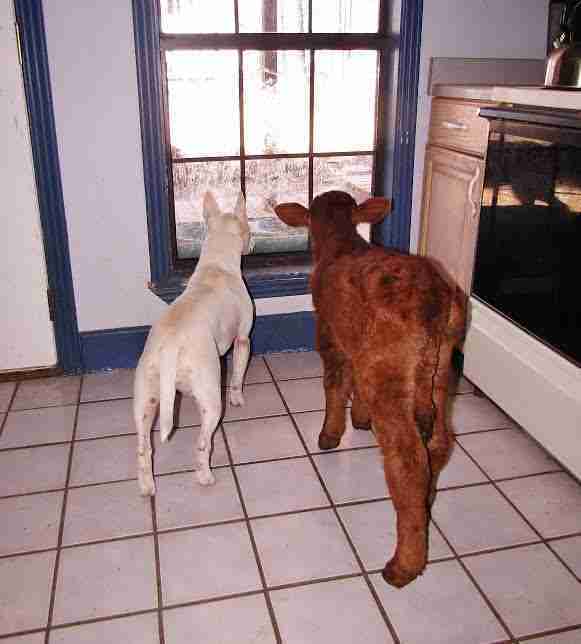 Moonpie was still a young, milk-dependant baby, so Wolf knew she couldn't keep her outside with the other rescue cows. "I don't have a lot of room here, and it was cold and rainy, and that wasn't good for a little calf," Wolf explained. "All my heated buildings were occupied with other critters, so that's how she ended up in my bedroom. I figured it would just be for a few days, but the weather just kept going whacky, so she's been in there for the last six weeks." Wolf's rescue dogs live inside Wolf's house as well, so Moonpie acquired several canine housemates. "They were all thrilled to see her," Wolf said. 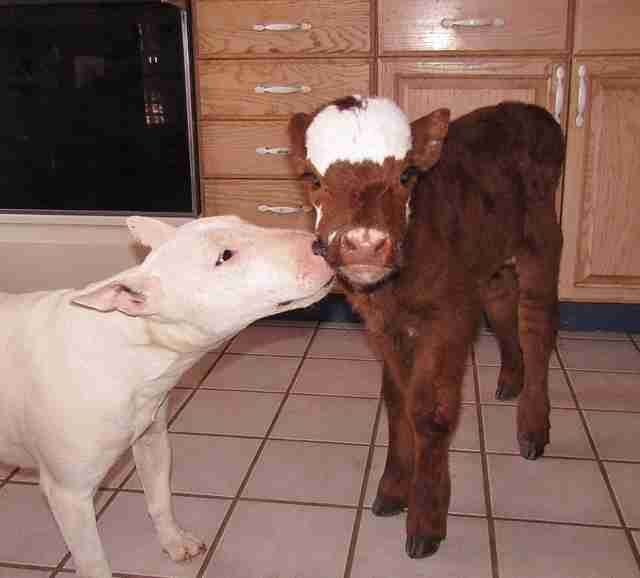 While all the dogs loved Moonpie, one took a special liking to the calf - a deaf white terrier named Spackle. 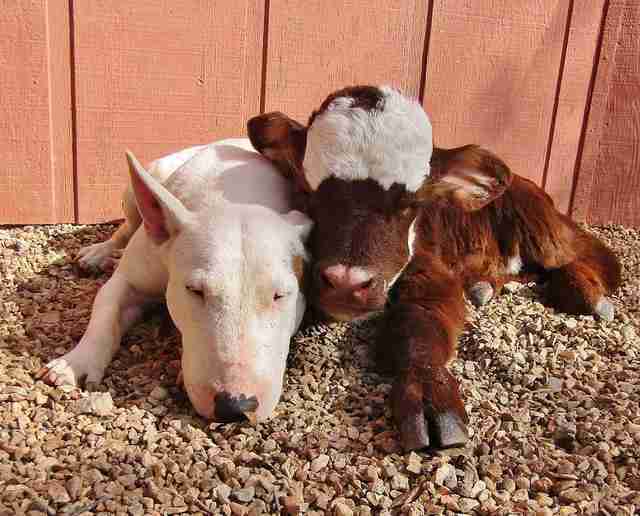 "The picture with the white bull terrier - that was Moonpie's first day here," Wolf said. "Spackle loves babies, and immediately became her protector and buddy. 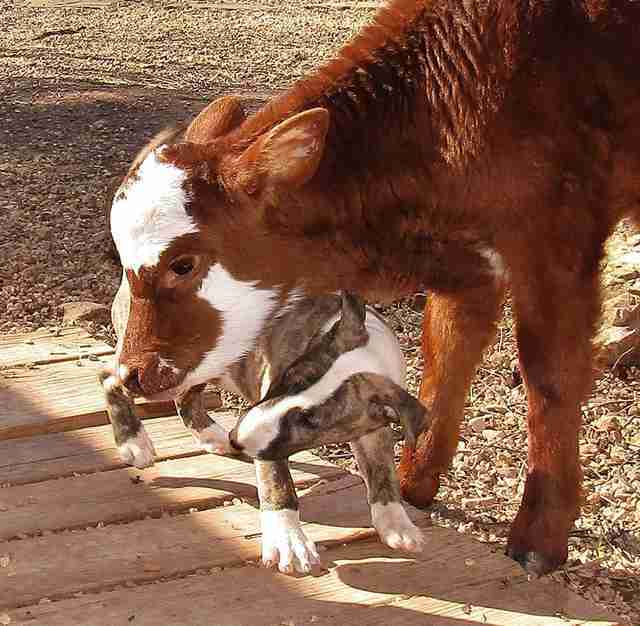 She wouldn't leave that calf's side. 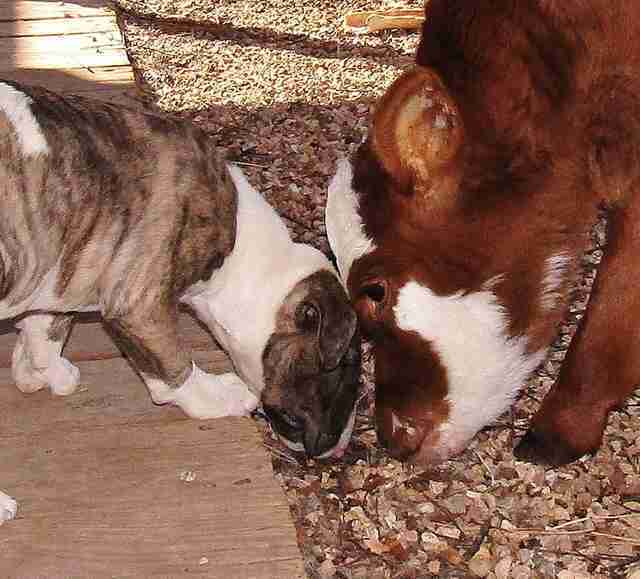 They instantly bonded." The dogs wanted to play with Moonpie, cuddle with her and clean her. "[The dogs] are her surrogate moms," Wolf said. "They clean her face, the way her mother would have. They love to do that." Moonpie even learned how to "use the bathroom," according to Wolf, the same way as the dogs, holding it until she can go outside. "She does what the dogs show her, so she learned how to do that," Wolf said. Now that the weather's getting nicer, Moonpie has been able to spend more time outside - and she got to meet the sanctuary's other miniature calf, Sooner. "At first she wasn't sure what to think, and then she just like, 'OK, a bigger dog,'" Wolf said. "But they started hanging together, too. 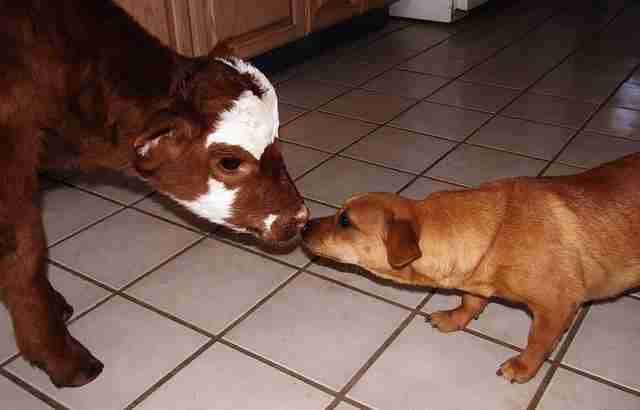 She now knows she's a cow, I think." Moonpie has a lot more growing to do before she can meet the other animals at the sanctuary, which includes an emu, a water buffalo, a zebra, capybaras, pigs, dogs, goats, chickens and other cows, all rescued from abusive and neglectful situations. While Moonpie waits for that to happen, she has a big family of dogs to keep her company. "It's all just a matter of who's in your space," Wolf said. "You love the ones you're with. I think she just knows that there's a lot of different friends in the world." To help Moonpie grow up to be big and strong, and to help Rocky Ridge Refuge rescue more animals, make a donation.